The Office of Minority Health (OMH) at the U.S. Department of Health and Human Services (HHS) invites you to visit their website to stay on top of the latest National Minority Health Month news, events and resources. Want to learn more about key issues in minority health and what organizations are doing to help achieve health equity? 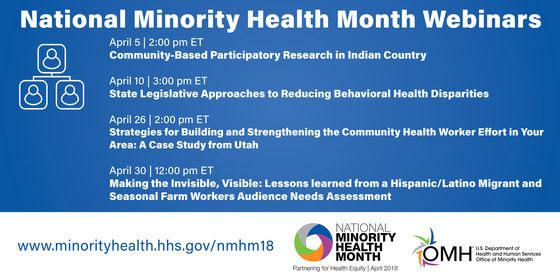 The Office of Minority Health invites you to participate in the National Minority Health Month Webinars during the month of April. Click here to learn more about each webinar and to register.